I recall my mind being blown when I learned about the “invisible gorilla” experiment in a course on visual perception. For those who are unfamiliar, I won’t give away the punch line just yet. Here's the video to experience it yourself. Did you see the gorilla? What Drs. Chris Chabris and David Simons demonstrated is that we are essentially “blind” to things that we don’t attend to. We can’t attend to everything at once and so we focus on what is most salient in our current situation. If you saw the gorilla, you probably lost count of the passes. Conversely, if you were spot on with the passes, you probably missed the gorilla pounding its chest. This phenomenon known was inattentional blindness happens in our everyday lives. I for one am particularly guilty of bumping into poles/chairs/things while texting, or completely walking past a friend on the street when I’m running to catch the bus. In short, we miss a lot of whatever goes around us and probably aren’t even aware of it. In most cases, missing out on things isn’t very consequential (except don’t text and drive!). But for infants, attending to the “right” things at the right time is crucial for development because, as William James put it best, the world to a newborn is a “blooming, buzzing confusion”. Fortunately, infants are born with an important predisposition to focus on a particularly informative stimulus in the visual environment—the face. Some researchers believe that a strong visual preference for face and face-like stimuli is critical for the developing social brain. The face is a treasure trove of social, affective, and communicative information. Visual behaviors are one way that infants amazingly learn all that. As adults, we can look at someone and know how that person is feeling, whether he or she is about to speak, or his or her interest in an interaction. Those judgments are things that individuals with autism spectrum disorders (ASD) often struggle with. Autism spectrum disorders (ASD) are characterized by impairments in social interactions, nonverbal and verbal communication, and by restrictive and repetitive behaviors. Clinicians and researchers alike have noted that individuals with ASD also exhibit deficits in eye-contact and preferentially attend to the mouth instead. This pattern of looking is associated with clinical measures of social disability. A few years ago, researchers discovered that there is a high recurrence rate of autism among individuals with a family history of ASD, suggesting a genetic component to the disorder. Infant siblings of a child with a confirmed diagnosis of autism have a 1 in 5 chance of developing autism as well. From what I had described above, it is possible to imagine that infants with autism focus their attention to non-social aspects of the environment and thereby miss out on the social learning afforded by attending to the face. The missed social learning opportunities compound over development to become observable symptoms of ASD around 24-36 months. 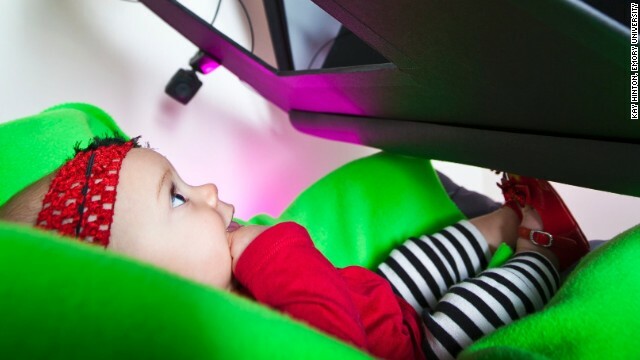 The infant sibling risk model, along with advances in eye-tracking technology, has in part allowed researchers to test this hypothesis by conducting longitudinal studies examining visual social attention in infants at high and low risk for ASD. Last week, a very exciting article in Nature provided a new perspective on autism. The study followed a cohort of infants at high- and low- risk for developing autism from 2-36 months and recorded their eye movements as they watched video clips of actresses engaged in infant-directed behaviors (e.g. pat-a-cake, nursery rhymes…). Drs. Warren Jones and Ami Klin found that although preferential attention to the eyes is present at 2 months, it slowly declines in over development suggesting that autism is the result of cascading and cumulative events due to missed experiences that would otherwise support socialization. Typically developing infants show patterns of increased visual attention to the eyes of caregivers. This early divergence is also hugely informative for thinking about the heterogeneity of the disorder in that it results from a combination of genetic vulnerability and atypical experiences. Furthermore, the findings emphasize the significance of early visual behaviors for social and cognitive development. A long-term goal for these researchers is to develop growth charts of social engagement. Similar to the physical height and weight growth charts in pediatrician’s offices, how cool and insightful would it be to have growth charts for normative social development?! I particularly also love what the following ABC news video has to say about the findings. The take-away is NOT that parents should be hyper-monitoring how much their infant look at the eyes (what the researchers found are rates of change in amount of time spent looking at the eyes over developmental time). Rather the findings paint a beautiful picture of optimism for families and individuals with autism. The intact predisposition to attend to the eyes implies that the neural basis to become socially engaged is in place. This offers great opportunities for treatment and a foundation for other researchers to begin exploring how those early attentional biases are derailed in some children and become autism. By beginning this post with the “invisible gorilla”, I hope readers will get a sense of how visual behaviors sculpt our potentially overwhelming environment into meaningful experiences and the importance of studying visual social attention among individuals with autism.